You are currently browsing the tag archive for the ‘Tuberville’ tag. I don’t care. It also gives me absoluetly zero insight into the situation at Auburn this season. Anyone who says otherwise just needs something to talk about. Which is every single one of us right now. Look, it’s been over seven months since there was football. And now, there’s football but there really isn’t football. All we have to occupy our attention with is practice. Have you ever thought about that the entire year, when it comes to football (and life really), the true action is somewhere between 40 and 50 hours. That’s it. In the amount of time that most of us work in a week, a season’s worth of games are played. That is the only truly substantive football we have. Everything else is just filler and fluff – some of it is good but the vast, vast majority of it is just junk like this. But in our Robert Langdon-like passion to unravel the mystery some of us read into the “signs” way too much. I rarely listen to Finebaum, but I happened to catch him yesterday and was amazed at how defensive the Auburn fans were. I’m just not sure over what – I didn’t hear, in my short time listening, any Alabama fans reading into the situation at all, although I am certain that they did. I am also fairly certain that the reactions would have been the exact same had the situation flipped. That’s just the nature of the this rivalry and I can see today how with a little distance and perspective it seems silly to so many. I can also see how, as a rival fan with nothing else to talk about it can be seen as somewhat comical when you’ve just been berated by your rival for a month and a half about how little character your team has and then the accuser becomes the accused. I think that’s why the wise man once said, “Those who live in glass houses…” In the SEC, and in this state in particular, we all live in really big glass houses. None are without reproach – so get over it if you feel “picked on ” today. 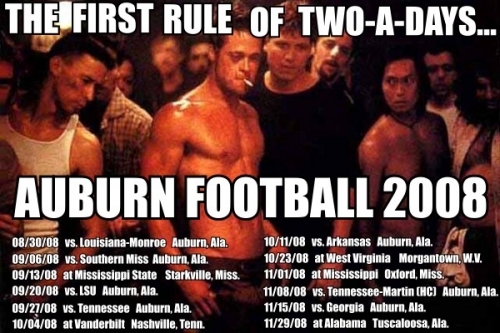 For any Auburn fans reading today – which is way up from normal thanks to the link from the War Eagle Reader – I, for one, read absolutely nothing into fights during Auburn practices. I don’t see it as an ominous sign that things have gone to hell there or proof that Tubberville has lost the team. In all honesty, it could be going on at Alabama and none of us would know because of the closed practices – which are now evidently the norm on the Plains (See, there might be a method to Saban’s madness). The season will be decided in the twelve or thirteen (or fourteen) games that your team will play beginning in 17 days. All else will be forgotten, unless things don’t go well – in that case all bets are off.